Slash has shot down as false a former GUNS N' ROSES manager's claim that an argument over the guitarist's collaboration with Michael Jackson is ultimately what fractured the relationship the ex-GN'R axeman and the band's lead singer Axl Rose. In a recent interview with the Brazilian edition of Rolling Stone magazine, Doug Goldstein — who managed GUNS N' ROSES from 1991 to 2008 — said: "In 1991, we were on the road, and Slash went to my office and said, 'I'll be leaving tomorrow to play with Michael Jackson at a tribute concert.' I told him not to do it because Axl was molested by his father when he was two and he believed the charges against Michael Jackson." He continued: "Everyone knew Eddie Van Halen received $1 million to play in 'Beat It'. So, I asked Slash, 'How much are you receiving?' and he said, 'I'll just get a big-screen TV.'" Axl was very hurt when he learned about the collaboration. "When Axl found out Slash was going to play with Michael Jackson and that the payment was a big-screen TV, he was devastated," Doug said. "He thought Slash would support him and be against all abuse. From the point of view of Axl, that was the only problem. He could ignore the drugs and the alcohol, but could never the child abuse." Slash played his final show with GUNS N' ROSES in July 1993, and by October 1996 he announced that he was no longer part of the band. So what would it take to repair the rift between the guitarist and Axl? "Slash would have to apologize for the episode with Michael Jackson," Goldstein said. "And I really believe … I'd be the manager to reunite them. I don't think anyone else could do it." 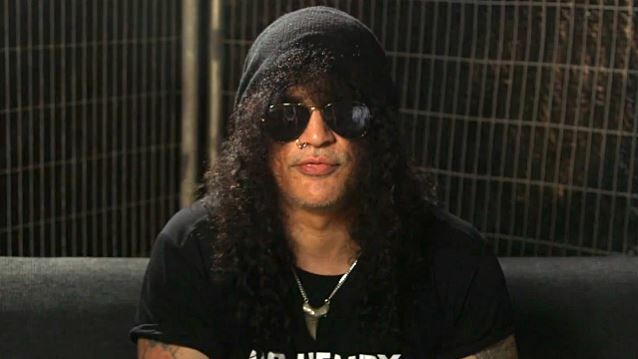 In a brand new interview with "Elliot In The Morning", the morning radio talk show hosted by DJ Elliot Segal, Slash was asked if there is any truth to Goldstein's claims. "You know what?! I've been hearing a lot about this particular interview from a lot of people that he really pissed off," Slash replied (hear audio below). "And I've heard that. And I don't think there's any truth to that. I mean, obviously, the band stayed together for years after that whole thing. And it wasn't a big deal at the time. And if it did piss anybody off, it was something that went away. So I don't think it had anything to do with the original GUNS N' ROSES' demise." Slash also explained that he doesn't go out of his way to read any of Goldstein's interviews that have to do with GUNS N' ROSES. "I don't wanna read or hear that guy's B.S., so I just avoid it," he said. "That way I stay sane. [Laughs]"